He was declared ‘Player of the match’ after his lethal bowling spell in the game where he grabbed 4-32 in the most important encounter of the tournament. It was the second title win for Mumbai Indians in the Champions League Twenty20 since its inception in 2009. Harbhajan Singh performed excellently in two finals and was declared ‘Player of the match’ on both occasions. The final of the Nokia Champions League T20 was held on October 9, 2011, at MA Chidambaram Stadium, Chepauk, Chennai, between Royal Challengers Bangalore and Mumbai Indians. Mumbai Indians were led by Harbhajan Singh and his team scored 139 runs before they were bowled out in 20 overs. It was not a big target for the rival team which had the services of thundering batsmen like Tillakaratne Dilshan, Chris Gayle, Virat Kohli, Mayank Agarwal, and Mohammad Kaif. The skipper of the Mumbai Indians led his team from the front while taking the important wickets of Gayle, Kohli and Daniel Vettori. The entire Royal Challengers team was sent back to the pavilion for 108 mere runs in 19.2 overs. He ended up with a match winning figures of 3-20 in four overs whereas Lasith Malinga, Abu Nechim and Yuzvendra Chahal shared two wickets each. The final of the 2013 Champions League Twenty20 was played between Mumbai Indians and Rajasthan Royals on October 6, 2013, at Feroz Shah Kotla, Delhi. Rohit Sharma was the captain of the Mumbai Indians who piled up 6-202 runs in the allocated 20 overs. Dwayne Smith, Glenn Maxwell and Sharma were the main batsmen who contributed quick fired 44, 37 and 33 runs. 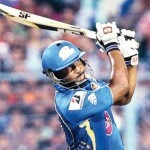 Rajasthan Royals were chasing the target superbly as long as Ajinkya Rahane and Sanju Samson were at the crease. They gathered 109 runs for the second wicket and enhanced the score to 117 in 11.5 overs when Samson was gone for 60 runs. The target still looked comfortable for the chasers until Rohit Sharma handed over the ball to Harbhajan Singh to deliver the fourth and last over of his quota. He started the 17th over in style by taking the important wicket of Rahane for 65 on the very first ball. Stuart Binny became the second victim on the fourth delivery when he was clean bowled for 10 while Kevon Cooper lost his wicket on the sixth ball and Rajasthan Royals were reeling at 6-159 in 17 overs. They never recovered after that and surrendered the last three wickets for another 10 runs while their innings came to an end for 169 with seven balls to spare.